Ixtur MAP-6, MAP-30 and MAP-40 are pneumatically controlled neodymium permanent magnets, which have excellent size / gripping force ratio and extremely low residual magnetism. The compact size combined with high gripping force make them versatile for various applications including: lifters, robot grippers, fixtures, production automation, etc. Ixtur MAP Pneumatic Magnets do not change their magnetic state if compressed air is lost – e.g. in case of a damaged pipe or compressor malfunction. This feature provides reliability and safety to material handling. 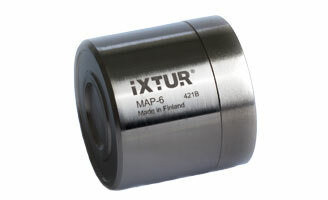 Unlike vacuum lifting solutions, Ixtur MAP magnets handle also perforated material. The magnets consume significantly less air than vacuum grippers, because compressed air is used only to switch the magnet on and off. MAP-40 is the best choice when gripping on rougher surfaces, e.g. parts made of cast iron.